Hurricane Irene was famously capricious in her march through the Northeast, with towns in Vermont and the Catskills washed away and others, directly across the Hudson, doused but otherwise unscathed. 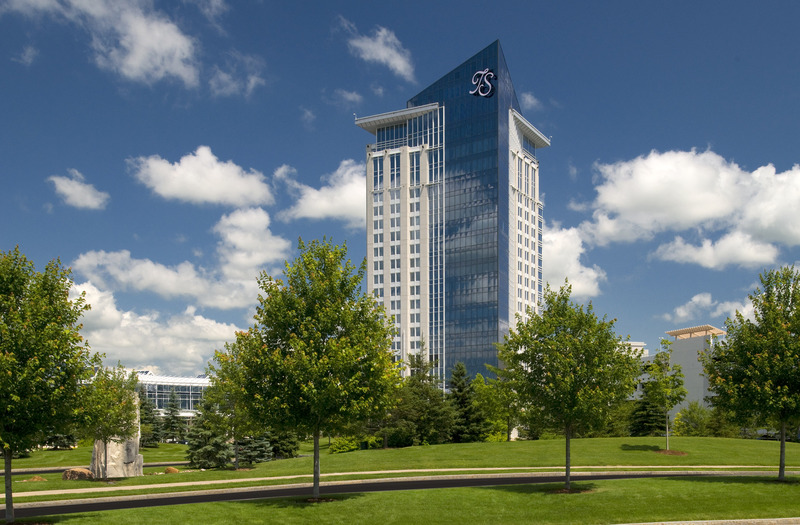 And while Turning Stone Resort – Casino, 30 miles east of Syracuse, wasn’t directly in the storm’s path, we didn’t know what to expect in terms of conditioning on the resort’s robust troika of 18-hole layouts. It turns out, no pun intended, that we’d never seen them in better shape, after a summer with a lot of rainfall but ultimately temperate conditions. The courses remain among the best trifecta at a single property to be found anywhere. It also seems that the vision of the owners, the Oneida Indian Nation, has in some sense been validated, as the golf operation was conceived to stand on its own, rather than as a standard amenity. Considering that the place only opened in 1993 and that the first 18-hole course – Rick Smith-designed Shenendoah – debuted in 2000, it’s no mean achievement, as Turning Stone has become a household name among golf-centric destinations. As is frequently the case, it’s tough to top the original, and Shenendoah Golf Club remains a favorite among the regulars. It’s easy to see why, as it touches all the bases of resort-course design: playable, slicer- and women-friendly, with mostly modest forced carries, although it can play as long as 7,129 yards from the most-distant of five sets of tees. Best of all, it winds through greatly varied topography, forest and meadowland, with the only reminders of the outside world the faint drone of motor traffic where the layout jogs within earshot of the Thruway and the occasional glimpse of the resort’s towering hotel. It’s a showcase for the region’s rugged terrain. The next course to come online was Kaluhyat Golf Club — pronounced gah-LOO-yut, an Oneida word meaning “the other side of the sky” – a strapping track that slopes out at 146 from the back tees, among the half-dozen highest slope ratings in the state. Designed by Robert Trent Jones, Jr. and built on a 220-acre site, it is hillier and more narrow, though slightly shorter, than Shenandoah. A glorious survey of the lush local ecosystem, Kaluhyat also has a number of dauntingly difficult holes, like the 11th, named “Uncertain Passage,” that’s 621 yards from all the way back and 563 yards from the white tees, most of it uphill. The greens also have considerable contour – problematic, no doubt, for first-timers on the course. Atunyote Golf Club – uh-DUNE-yote, meaning “eagle” – is the most recent course addition and plays the most like a “resort” layout, slightly less punishing than the other two. Unlike its sister courses, it is several miles from the resort, and the contours of its grassland setting can be reminiscent of designer Tom Fazio’s work in Florida or the tropics — vast open spaces, gently rolling terrain, and some adroitly deployed water features. Good fun for average players, it can also be made testy enough for the pros, some of whom, including Tiger, were there to play in the fund-raiser for Notah Begay’s charity during our visit. 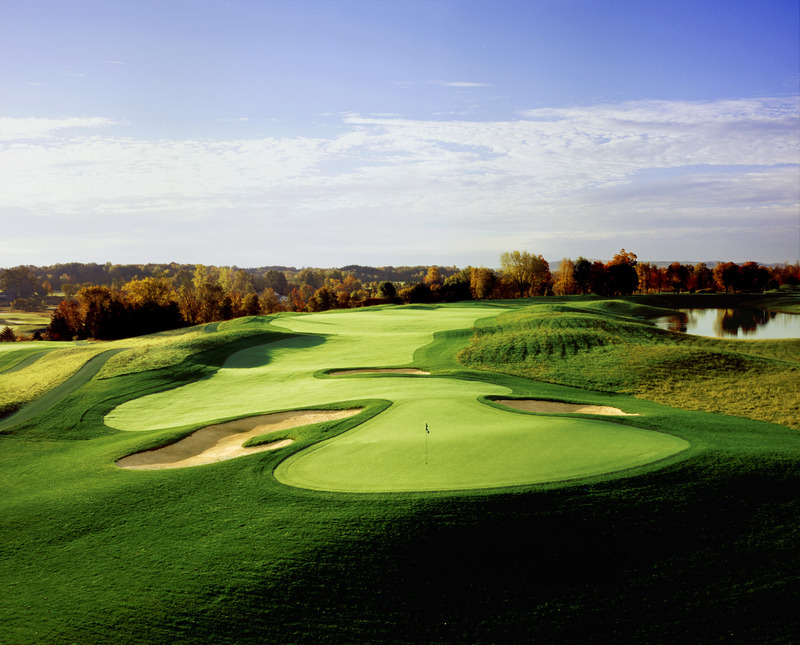 Turning Stone also has two nine-hole layouts, Pleasant Knolls and Sandstone Hollow, which presumably comes in handy in accommodating guests who play golf only during their annual casino pilgrimage. It also has the Golf Dome, an elaborate practice facility with academy, clubfitting, and two-tiered range with 48 bays, a truly welcome buffer against upstate New York’s sometimes-punishing winters. In fact, you have to quibble to find fault with the golf operation – this reporter’s gripe would be that the three courses are unwalkable, for instance. Seen in the context of the whole package, however, it’s pretty remarkable. 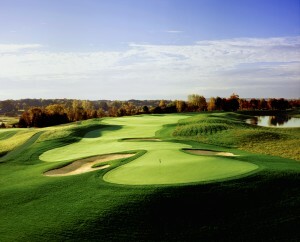 Turning Stone's sometimes raucous atmosphere contrasts with its serious-golf counterpart. The Tower serves as action headquarters. that they can co-exist with limited symbiosis. When we asked about a late checkout from the hotel – The Lodge is the smaller, upscale option – we were given an extra hour, as the desk was expecting the arrival of seven wedding parties for the weekend. The ex-desk clerk in me immediately empathized. 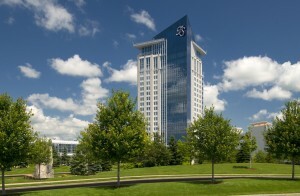 The point is that Turning Stone Resort – Casino generally is a pulsating concern, handling more than four million visitors annually. Establishing a first-rate golf destination that’s both right next door and a world away is a clever twist.